It is very important to perform periodic maintenance on oil water separators in order to keep them operating properly and efficiently. If they are not drained and cleaned on a regular basis, both oil and solids can clog the insides of the oil water separators, rendering them ineffective and oil in the outlet water may exceed specified effluent limits. For below ground oil water separators, it is more important to follow an established maintenance schedule since everything is out of sight (and therefore, out of mind for the most part). Stop the flow of influent to the separator. Dispose of separated oil per company and regulatory procedures. Remove water from separator through drain or hose. Measure and record the depth of the solids. Use this measurement as the timing basis for the next solids inspection and clean out. Solids should not exceed the depth of the sludge baffle. If needed, remove the solids with either a sump sucker or drain. Clean the Media Plates - The media plates can be either cleaned in place or removed and cleaned. For cleaning in place, connect a low pressure water hose (15-45 psig) and insert in plate spacing on top of the plate packs. As the water flushes the dirt out of the plate packs it should be removed via the drain valve on the hopper outlet. For removing plate packs outside of separator. Flush with hose (10-45 psig) and prevent discharge of flushed water into groundwater. 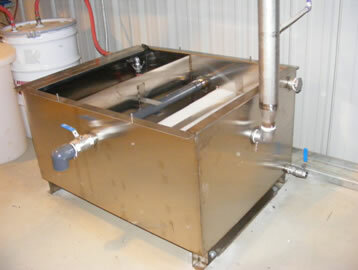 It is only necessary to remove all sludge from between the plates and any very heavy oil coating. Examine tank interior for damage and repair any damage to internal coating. To restart separator, reinstall media plate packs and polishing pack in their original positions. Make sure that both are securely in place so that they do not float when the unit becomes operational again. Depending on the application, and the amount of solids, sludge and oil involved, the maintenance procedures should be repeated on a regular basis by qualified personnel.